Author: Catherine Griefenow-Mewis, Tamene Bitima. Series edited by: Wilhelm J.G. Möhlig, Bernd Heine. This exercise book completes the Oromo basic course Lehrbuch des Oromo. It contains translations of the Oromo texts and the key to the exercise part, as well as sentence and conversation practice, thus serving for the training and expansion of the learner’s speaking ability. 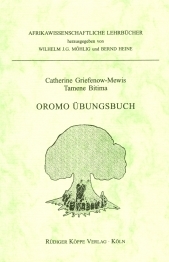 In the German translations the author tried to stay as accurate as possible to conserve the Oromo constructions. Where this was not possible because the German sentences became ungrammatical, literal translations are added in brackets after intelligible German constructions. Dispensable for self-instruction, the exercise book is a useful support for students who try to learn Oromo apart from teaching lessons.